The size of every tea leaf matters. Leaves that are consistent in size, shape, and color mean that the cup of tea will be complex and consistent. The leaves will steep evenly, delivering a brew that has a unique aroma, body, taste and aftertaste. And it’s much more work to grow and select and process leaves that entirely the same throughout. It takes a lot more work to choose only those leaves that are the same. It requires more attention to each leaf. And the results are noticeable. It’s why our tea is so good, so full of complexity and nuance and awesomeness. Look at our leaves and you’ll notice that the English Breakfast Black tea is uniform throughout, and entirely different than our Green Ecstasy. Our farmers pay attention to every leaf they pick, ensuring this consistency stays true. We begin every day at Samovar, before anything else, by donning our apron. Hand made locally in San Francisco, our denim aprons set the stage for the day’s work. Putting on the apron means we are entering the world of service. Putting on the apron means we are taking off our egos, our issues, worries and concerns, frustrations, annoyances, and leaving them outside our store. When we don our clean apron, we are also putting on a clear mind. We use this practice as the first step in becoming self aware of our work and our role as server of tea. We are now harbingers of joy, quenchers of thirst, and creators of energy. Once the apron goes on, we clear our mind for the day’s work of greeting, serving, and connecting with every guest we meet at Samovar. The apron is the mirror of our mind. Putting on our aprons we ensure it’s clean, straight, and ready for work. We ask a buddy to check us out, confirming we are in fact ready for work. The details matter with something as simple as our apron. If we pay attention to the details of something seemingly mundane, then we can pay attention to the cup of tea we serve. To the environment inside our stores. To every single guest. To our co-workers. It begins and ends every day with the details, and the first detail is our apron. Our tea makers go through weeks of training. Not only how to brew and steep and simmer our masala chai and how to whisk matcha, but training their taste buds to be able to differentiate and communicate the qualities of a first flush Nishi Sencha. The nutty aromas of a Tieguanyin dark twisted oolong, the sweet earthiness of a Turmeric Spice herbal blend and many more. We train for determining tasting notes, for serving guests rapidly, for communicating nuances in tea, for how to open, run, and close up our stores. 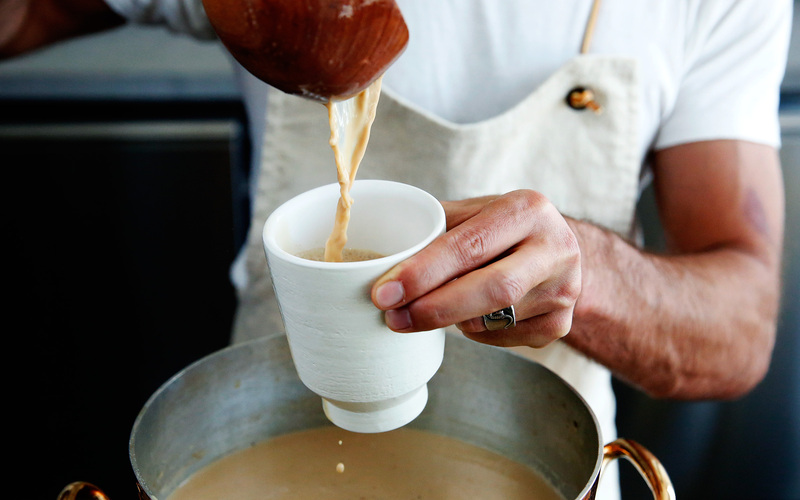 The work at Samovar is “just tea,” and it’s a lot, and not easy. Certainly, it’s not for the faint of heart. We hire only one out of every 100 applicants. That’s correct. For every 100 people who apply to Samovar, only one person makes the cut. Do you have what it takes to pay attention to the most basic details, to have super attention to guests needs, to work really fast and appear really calm, to support your co-workers and work in a team of pros, to never lose your cool and love challenges? Can you learn really fast, and do you simply love tea? Then maybe this is the right job for you. If you wake up every day with the desire to make the world a better place by connecting to other people, helping your fellow humans in your act of serving them tea, then apply today to Samovar. If you think you are the 1% of humans who have what it takes to serve tea, please, join our cause, don our apron, and helps us make happy humans by achieving our standards of excellence in all we do at Samovar.